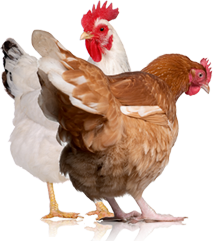 What and how to feed chickens varies with a bird's age, the season and type of chicken. Here are basic items to consider for your flock's feeding system. Chickens are simple: You just put up some fencing and let them do the rest, right? Well, not exactly. Many of our domesticated chicken breeds need a bit more in the way of nutrition than their progenitor, the red jungle fowl. This is because humans have bred farm birds to be high producers of eggs and meat. Abundant, healthy output means they need abundant, healthy input. Here are a few things to consider as you look at your flock’s feeding system. A rapidly growing day-old chick needs higher protein than an actively laying hen or a bird in molt, for example. Each age and stage of a bird’s development—throughout its life and throughout the calendar year—commands a different ration. Always feed young chicks starter feed or broiler feed, depending on their purpose, and offer this free-choice, meaning, make it available at all times. 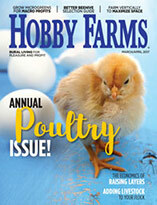 Laying hens should be offered a layer feed, designed with the proper amount of protein for hens actively laying eggs. Birds in molt need higher protein in general; feathers consist of more than 85 percent protein, and it takes a lot of energy to grow new feathers. This can often be supplemented in other ways. If you live and tend to a flock in a region with fluctuating seasons, keep the months in mind when providing treats. High-protein treats, such as mealworms, are great in the fall, when many birds are molting. Scratch is a fatty snack that encourages a bird to bulk up and is best reserved for winter. When laying resumes in the spring, support your hens with fresh abundance of their calcium-rich layer feed (preferably organic). In summer, follow the season and offer green treats, particularly allowing ample time to forage. A happy chicken is a foraging one. Every bird should know the freedom of ranging, the warmth of the sun and the satisfaction of hunting its own feed. Chicken emotions aside, an active bird is a healthier bird, adding variety to its diet and keeping the fat stores around its reproductive system to a minimum, which increases egg laying and fertility. For laying hens, calcium supplements are critical. Many chicken keepers offer them in the form of oyster shells, produced and sold for this very purpose. “Laying hens use the calcium from their bodies to form eggs,” writes Pam Freeman in Backyard Chickens: Beyond the Basics (2017). “Almost half the calcium a hen needs to form an eggshell comes from her bones.” If they aren’t getting enough calcium to replenish their stores, their bones can become weak. For birds that are lucky enough to be spoiled with kitchen treats and compost access, provide the right-size grit free-choice in a separate feeder in the coop. Grit assists in digestion, as a chicken doesn’t have teeth, but rather a gizzard, an oval organ composed of two pairs of thick red muscles. Offer oyster shells and grit in their own containers, separate from the feed and full at all times. Flock members will take what they need when they need it. Summer or winter, hot or cold, access to fresh clean water is an absolute must. Even before feed, water should be considered the most critical “feed” element. Laying hens that go without water for just 24 hours might experience decreased laying abilities for a month or more. Hens that go without water for a longer period might sustain irreparable damage and never fully recover their egg-laying frequency. 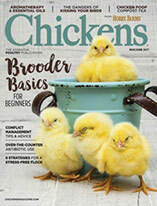 “Water helps to remove waste products produced by food and exercise,” writes chicken-keeper Virginia Shirt in The Right Way to Keep Chickens (2007). “As food is eaten, water softens the corn or pellets and aids the extraction of vitamins and minerals from the food. Chickens, being small animals, do not ingest great amounts of water at a time; however, they do make many visits to the water supply throughout the day.” Also, many supplements are administered by being added to water. It’s true that chickens are easy and don’t ask for much. Anticipating their needs and meeting those needs before anything goes awry keeps them happy and healthy in the long run. Good food, plenty of water, a few extras and access to the outdoors will keep your flock in tiptop shape.